Spring Integration (SI) is a framework enabling a collection of individual applications to integrate together to deliver a business enterprise system. The framework is essentially a lightweight messaging system that enables spring based applications to communicate with one another and supports integration with external systems via declarative adaptors. It is based on the 'filters and pipes' design architecture. A key feature of it is that it achieves this integration in a minimally intrusive way. Encapsulate the data to be transferred from one place to another. They comprise of a header (holds meta data such as message-id, timestamp, etc) and a payload (your data typically in the form of a POJO). Provide a mechanism to transport messages from one endpoint to another. Represents the pipes in the pipes & filters architecture. SI offers two types of channels, namely Pollable and Subscribable Channels. The former rely on consumers to periodically check for messages whereas the latter is directly responsible for notifying registered consumers when messages become available. Consumer/Producer of messages. Performs some action based on the payload. Endpoints come in various flavours, each performing a different function. 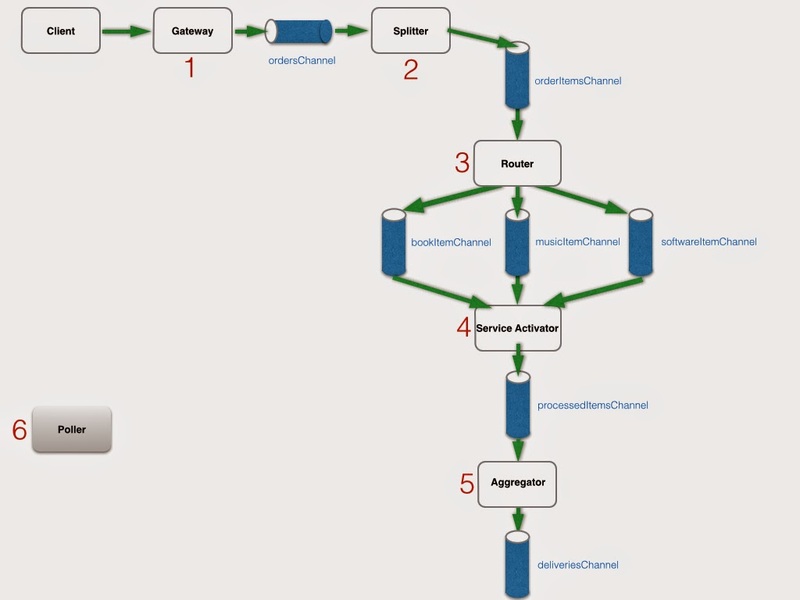 These include Transformers (transform data), Routers (route data), Filters (filter data), Splitter (splits messages), Aggregator (aggregates group of messages into single message), Service Activator (connecting messages to Services) and Channel Adapters (connect channels to external applications). The basic idea behind the SI framework is that applications communicate with each other by sending/receiving messages. These messages would typically contain the information (payload) required by the next application in the process pipeline. The transport of messages from one application to another is performed by Channel components. The Endpoints perform some action based on the payload. This could be routing the messages to another endpoint or processing the payload itself. The objective of this post is to provide an introduction to Spring Integration. To help achieve this, I developed a sample application which will be discussed below. The source for this sample application is available at here. The project was built and run using spring-integration-4.0.0, maven 3.2.1 and jdk1.6. My goal as usual was to build something very simple which would help me to become familiar with key concepts of this framework and to this end I've knocked up a simple app which does not connect up individual systems but rather invokes methods on a POJO. Extending this to actual working applications shouldn't be too difficult. The scenario I'm going to model revolves around purchasing items from an online store (Tabernus). This store only sells 3 types of items: Books, Music CDs, and software. During a Sale, the owners have decided to apply different discounts based on the item type. In this instance books, music and software benefit from discounts of 5%, 10%, and 15% respectively. The following diagram shows our domain entities. The class diagram shows that a Customer can place an Order comprising of a number of OrderItems which are of type Book, MusicCD or Software. The problem I need to solve is to design a system which can interrogate each Order and apply the correct discount based on the item type. Subsequently it should be able to compute the total cost of the order once the discounts have been applied. The above diagram shows various components most of which can be divided into 2 categories, channels (blue cylinder shapes) and endpoints (rectangular boxes). The exception to this is the Poller component whose purpose is to enable the various endpoints to function correctly and discussion of it will be given later. We'll start off by briefly covering the various stages in this pipeline as indicated by the numbers in red. Following this we will delve deeper into how we build this pipeline using the SI framework. The Gateway component represents the entry point to the messaging system. All new Orders will be submitted to this component which will in turn wrap them as messages and place them into the channel appropriately named ordersChannel. Using the Splitter component - each Order is decomposed into a collection of it's constituent OrderItem instances. Each of these is wrapped in a Message and placed in the orderItemsChannel. The Router component considers each OrderItem in turn and places it in the relevant channel, e.g. Book items will be placed in the bookItemsChannel etc. This allows us to consider the different item types separately. The ServiceActivator needs to consider messages within each of the 3 channels and calculate the correct discount based on the channel. After completing the calculation for each OrderItem, it will place the OrderItem in the processedItemsChannel. The Aggregator component will collect all OrderItem instances placed in the processedItemsChannel and reconstruct the original Order. This will subsequently be placed in the deliveriesChannel, which represents the end of the pipeline. The Poller Component is required to configure how often the various endpoints will interrogate their respective input channels for messages. implement the various end points. configure the pipeline in an xml file (Shop.xml) - identifying the various channels and endpoints and how they wire up together. At this point I should mention that SI offers 2 approach to configuring your process pipeline, annotations based and xml. In this article I'll be using the latter. Let's start to look at some code. We'll consider each stage described above and show the java implementation of the endpoint and xml configuration required to wire up the components. The logic here is quite simple. The client creates a dummy Order and passes this as an argument when it invokes the placeOrder() method on the gateway component. The gateway component referred here as Shop is injected by Spring. As you can see, this is simply an interface, whose implementation will be provided by Spring when it is injected into the client application. This is achieved by the use of the @Gateway annotation which informs Spring that this is a Gateway component and it needs to provide the implementation. Additionally the annotation accepts an attribute, requestChannel which defines the channel on which the Order instance will be placed. The framework does this by simply wrapping our instance of Order within a Message instance and placing it in the channel, 'ordersChannel'. Implementing a splitter is quite easy and involves extending the AbstractMessageSplitter class and overriding the splitMessage() method. This simply takes a message containing the payload of Order and returns it's collection of OrderItems. Nothing too complicated here. For each OrderItem, the method routeOrder() will determine it's item type and return the name of the channel that this message should be sent to. The channel name is returned by the method. Spring will then ensure that the message containing the OrderItem is relayed to the named channel. The config identifies that the class OrderItemRouter is a Router component which will consume messages from the orderItemsChannel. Further Spring needs to invoke the method routeOrder() which contains the logic to perform the routing. This tells Spring that the Shopkeeper class is a ServiceActivator and will consume messages from any of the 3 channels defined in the input-channel attribute. When a message appears in one of these channels, Spring will invoke the appropriate method on the ServiceActivator class as specfied by the attribute method. Anything returned from all three methods will be placed in the processedItems channel, ready for the next step of the processing pipeline. The stdout-channel-adapter component writes to the systems STDOUT output stream. In this case, we have declared a global poller (as indicated by the default attribute). This will be used by the various end points to determine when they should interrogate their respective input-channels for messages. The second attribute fixed-delay is used to configure the polling interval. The logging shows that the Customer submitted an Order for 3 items, one of each type. All items cost £100 each. The Order was then split into 3 OrderItems each of which was routed to the correct processing channel based on the item type. The ServiceActivator (Shopkeeper) then calculated the discount for each item and this was set on the OrderItem instance. The OrderItems were then aggregated using the OrderCompleter class which displays the final discounted price of £270 to be paid by the Customer. Note that the messages are logged to be in different stages of the processing pipeline despite starting off in the same order. This completes the tutorial on the Spring Integration Framework. Any comments relating to corrections, omissions, etc are welcome. Published at DZone with permission of Mo Sayed , DZone MVB. See the original article here.